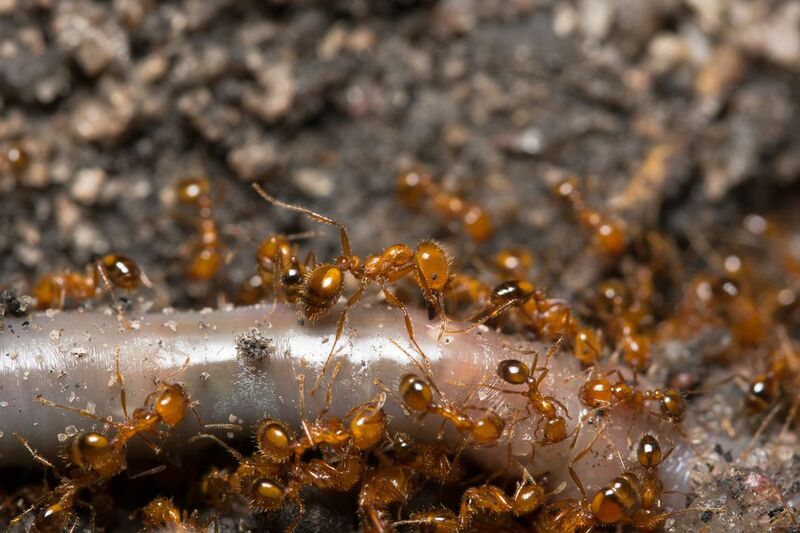 Fire ants strike fear into the hearts of South Florida visitors and residents. These small red creatures pack a toxic bite that leads to painful swelling, itching and stinging sensations. Homeowners who have experienced fire ant infestations in their yards know that they can also be quite difficult to drive out of an area. In this article, we’ll take a look at the biology of the fire ant, how you can treat fire ant bites, and some tips for controlling fire ants if they appear near your home. The term “fire ant” actually is not at all descriptive, as there are almost 300 known species of fire ant located around the world. When we use the term in South Florida, we’re typically referring to the red imported fire ant (solenopsis invcita). These ants are native to South America and were accidentally introduced to the United States through a cargo ship that docked in Mobile, Alabama in the 1930s. They then quickly spread through the southern United States, including a heavy infestation in Florida. The red imported fire ant, shown in the photo, has a three-sectioned body, three sets of legs, and antennae. They range in size from 2-6 millimeters and have body colors ranging from black to red. The common characteristic that all fire ants share is their ability to inject their prey with formic acid, causing a painful toxic reaction. In most cases, fire ant bites cause significant discomfort but can be treated at home. The most important first aid step you can take is to thoroughly wash the area of the bite as soon as possible after you are stung. This will remove any remaining venom that is left on the surface and lessen the impact of the bite. After washing the bite thoroughly, apply ice to the area of the bite for 30-60 minutes. This will reduce the swelling and hopefully leave you with less unpleasantness over the next few days. Then, follow the advice your mother always gave you – don’t scratch the itch! It really will only make things worse. If the itching is unbearable, you might try applying Calamine lotion. If symptoms persist, an over-the-counter antihistamine may provide some relief as well. Of course, if you think that the victim is suffering a severe allergic reaction, you should seek immediate medical care. You should waste no time visiting one of Miami’s emergency rooms or urgent care centers. Allergic reactions can be extremely dangerous and result in severe injury or death if untreated. Symptoms that indicate a need for immediate medical treatment include chest pain, difficulty breathing, slurred speech, paralysis, and particularly severe nausea, swelling or sweating. If you have fire ants in your yard, you’re familiar with the frustrating experience of trying to drive them out. One of the most often-used home remedies is to pour boiling water on the fire ant mound. This burns the ants and may provide some temporary relief, but chances are that the queen and colony will survive and simply move to another area. The best you can hope for is that they will move to an area outside of your yard! There are many commercial poisons available that control fire ants. If you want to try a do-it-yourself approach, visit any local home store and consult with a professional for advice on the chemicals to use. If the do-it-yourself route doesn’t seem to work for you, consider hiring a professional exterminator. Professionals not only have significant experience dealing with fire ants, they also have access to insecticides not available to the general public. Who Are the Federal and State Florida Legislators? What Do the Warning Flags on South Florida Beaches Mean? What Types of Plants Thrive in Miami's Climate?